DETAILS Cut red construction paper to make a card to fit the envelope you are using. Remember you are going to fold the card in half so double the dimensions. See our instructions for making your own envelope if you need one. Using the Jackson Pollock program, create a painting on the computer. Print on white paper. then get creative. Use the art work as a background or a heart. 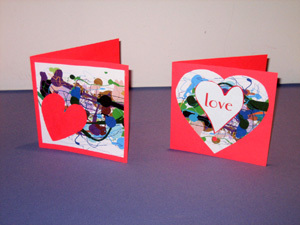 The hearts I added to the Pollock design were cut and pasted. I've provided you with two ideas for starters, you'll think of many more. Have fun! MATERIALS NEEDED Red construction paper, computer, printer, computer paper, scissors, glue. Click to submit your comments and rating.